28th May 2011 was a wonderful day here at Gwalia as it was the day when the lovely Amy and I became Mrs and Mrs, or rather Ms and Ms as we prefer it. I write this because having had so many people want to come here for a romantic getaway, it seems only fitting that we tell you about our own little celebration. To start with, it rained all week in the run up to our Saturday wedding. It even rained all morning and so there was much concern about whether we were entirely sane to organise a wedding in a field in Wales. Nonetheless, the marquee was up, the bunting was hung, the bouncy castle was waiting in the wings and we were ready. The place looked fantastic. Friends and family arrived from all over the UK, many of whom pitched their tents in our little campsite and the whole event felt like going to an amazing festival with all of your mates. In fact the event was unofficially deemed “Wedfest”. Come lunchtime, as we rather nervously got dressed and make-uped and haired, the skies began to clear. Yes, actual blue skies. It felt like a good omen. As the guests assembled on the lawn, seated on picnic rugs and plastic chairs, we were sitting in the cabin all ready to make the dramatic entrance. It was magical. The sun was streaming through the green leaves making them glow brightly and the yellow iris’ were blooming on tall green stems by the lake. We weren’t even living in Gwalia at that time but I knew then, as I was about to enter the Chandler family, that this place would become a big part of my future. As we stepped into the throng of well-known faces, through the specially made willow archway, 2 red kites circled high over-head. The celebrant welcomed us all to this beautiful green place and in what seemed like a blink of an eye, we were married. Forever! We kissed and then ran gleefully towards the bouncy castle for a celebratory bounce. The rest of the day passed by in a bit of a blur really. Everyone was sitting about the marquee, eating from picnic hampers and drinking wine, whilst the usual speeches and merriment ensued. An evening ceilidh from the local band gave way to random disco classics and as we lit the bonfire, we danced and sang our way beyond the setting sun. Over by the cabin, Harry got the barbecue going to feed the hungry hoards while our friends secretly decorated the cabin for us. We spent the night there, which at that point was very, very different from its current state. It was however, as special as ever to wake up to the sounds of the birds chirping cheerfully to herald a new day. The photos in the gallery below were all taken by local, awarding winning photographer Tina Jones who is lovely! This entry was posted in Gwalia Life and Living on May 16, 2014 by Amy. Along with house renovations and developing a new business, it’s hard to forget that we live on a working small-holding. There are some inevitable parts of farming which one doesn’t tend to think about whilst perusing the meat isles in Tesco’s. You purchase your nicely packaged bits of meat and the hardest part is coming up with something tasty to do with it. There is however an awful lot of work which goes in to getting that piece of meat into your fridge and I now have a much greater appreciation for that process. I’ll spare you the gory details but let’s just say 6 out of 12 of our new batch of chickens were cockerels and alas surplus to requirements. Tasty as our free range, organic chickens are I had my eye on another type of bird for the dinner table. 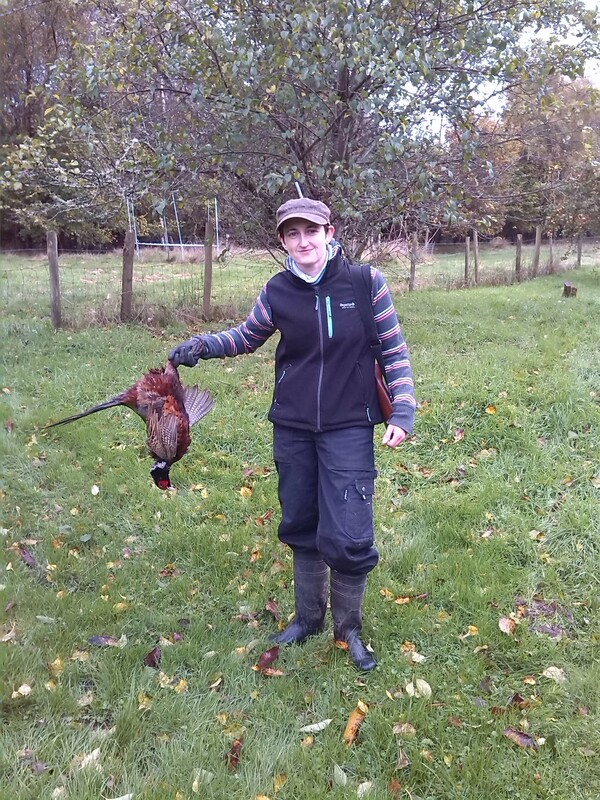 There are a few pheasants roaming around these parts and so I started doing a bit of target practice using Harry’s air rifle and a few old tin cans. I was getting pretty good at hitting my target when one lunch time I seized my opportunity. We hung it for 3 days in the shed and rather than plucking and gutting as we did with the chickens, removed the leg and breast meat all ready for Amy’s Casserole dish. I’d never shot anything before and didn’t find the whole process particularly enjoyable but there is something rather satisfying in catching your own dinner. This entry was posted in Gwalia Life and Living on November 1, 2013 by Dee. Following on from all the cool things we could do with strawberries, jam was one of the obvious options which would store well and draw out the fun. Armed with some of my mother’s advice, Amy’s mother’s advice and a recipe off the BBC website I set sail on my maiden voyage of jam-making. I prepared thoroughly. Strawbs ready, sugar weighed, saucers in the freezer and jam jars sterilizing in the oven. Recipe / mother’s emails on the side and I was ready to go. It all started quite well and the house quickly filled with the lush sickly sweet smell so reminiscent of my youth. Livy appeared early on to check I was ok and passed on her words of advice “think about the science”. Now, as you may know, my life skills lie neither in cooking nor science and so alas things quickly deteriorated. In my defence, the test to tell if jam has reached it’s setting point is very subjective. Put a dollop of said jam on a cold saucer, poke your finger in and if the skin wrinkles it’s set, if it’s liquid you need to keep boiling. Now, that all sounds very simple but with such treasured ingredients I really didn’t want to produce a runny jam. I mean, I’d never live it down. And so I kept boiling…and kept boiling…and then it started to turn a funny dark blood red colour and that lovely sweet smell was replaced by something else. In short, as my father would say, I burnt the arse out of it. Livy had to come and rescue me and it was all very, very embarrassing . At one point there was a discussion as whether we should just boil it a bit more, pour it in a baking tray and slice it up to make strawberry toffee. Runny jam would have been better however as it is, I have a “very concentrated” batch of jam. Still edible although definitely not as my mother used to make, barely jam at all really. Caustic soda and a lot of elbow grease was required to restore the pan and I was quite frankly, mortified. 2 days later though I was back on the horse, albeit under strict supervision. Black currant this time, much easier. This entry was posted in Gwalia Life and Living on August 10, 2013 by Dee. Aaaaannnnd now…it’s the moment you’ve all been waiting for…heeeeeerrreee’s “Strawberry Season”! There have been rumours that it was coming, stories (oh the stories!) about the great strawberry years! Finally the season is upon us. To be honest I thought it was all part of a great rouse to lure me to mid-wales but I can confirm that the tales are true. 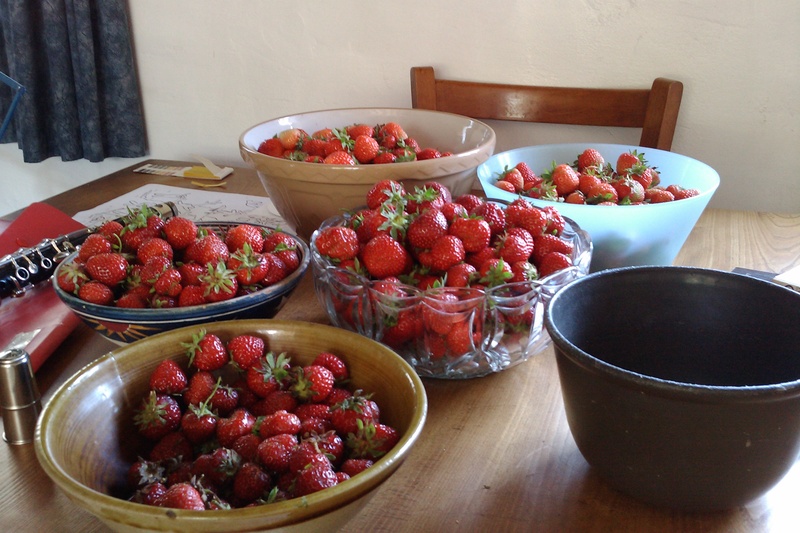 There are bowls and bowls of strawberries and they just keep coming! To avoid A) eating strawberries for breakfast lunch and dinner and B) freezing them for later, which just makes them lose their delicious flavour; we have embarked on a “how many cool things can you do with strawberries?” mission. We’re still waiting to indulge in the delights of the Strawberry liqueur but early indications are very promising, so in the meantime we’ve been indulging in all other forms of delicious strawberries. Most of these involve some sort of cream accompaniment which, whilst truly yumtastic, has been the cause of a few missed dinners this month due to mid afternoon over-indulgence . This entry was posted in Gwalia Life and Living on August 4, 2013 by Dee. [singlepic id=58 w=220 float=left] Since arriving at Gwalia we have started to get keen on the ‘good life’ of making stuff, some such stuff is wine. This isn’t really a new idea. Harry and Livy used to make wine when I was little so there’s a fair amount of bottles and equipment tucked away at the back of one of the barns. I went exploring! We threw it away and endeavoured to make our own. Probably not worth ageing this stuff for 25 years though. This entry was posted in Gwalia Life and Living on August 2, 2013 by Amy. This entry was posted in Gwalia Life and Living on July 31, 2013 by Dee.